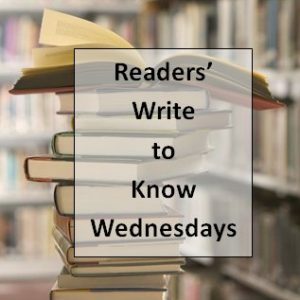 I’m excited to introduce Teri Thackston for today’s Readers’ Write to Know Wednesday! 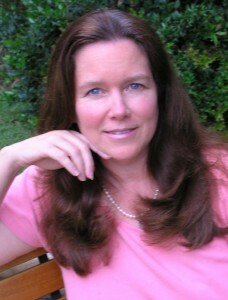 Teri is the author of the paranormal romance, Wait Until Moonrise. Enjoy the interview, and read how a waltz in a Disney movie sparked an entire book! Hi, Hallee. Thanks so much for inviting me to guest post on your blog. I’m a born and raised Texas girl with a deep pride in my state and my family, as well as a strong faith in the Lord. My husband was my high school sweetie and we have two handsome and talented sons. I’ve been writing stories since I could string words together on paper, but only started publishing my book-length stories a few years ago. Moonrise is a paranormal romance that begins in 18th century Wales with a spell cast upon Nicholas Pierce, Earl of Beaumarith. A sorceress curses him to be unseen and unheard until his true love frees him by professing her love in the moonlight. More than two hundred years later, Bria Leighton, an American school teacher, arrives at Beaumarith castle. She is frightened by the sight of a handsome ghost that appears to her only in moonlight. Once Nicholas explains that he is no ghost and that only his true love can see him, Bria wants to help him. But there are two problems: she’s already engaged to be married and the sorceress—Saffira—has returned to claim Nicholas for her own. 3. How did you determine whether to self-publish or seek a traditional publisher? I’ve actually gone both routes, starting with publishing several books through Ellora’s Cave’s Blush line. It’s been a great experience, and I plan to continue it. But I wanted to try self-publishing, too. So far it’s working out well, so I hope to continue both paths. Never, ever give up on your dream. It took me a long time to finally get my first book published. Life got in the way so many times, but I made time to write whenever I could. It is a dream come true for me, and it can be for anyone else who works hard at the craft. You just have to stick with it. 5. How did you make the initial step into writing your first novel. What were some of your major roadblocks and how did you overcome them? Actually, I wrote my first novel when I was about fifteen years old. I was hand writing it and my dad noticed. The next day he borrowed an old electric typewriter from his office so I could type my book. Since I was taking a typing class, that typewriter filled two needs: it allowed me to practice typing and write my book. As for roadblocks—the day job, family obligations, too much television, not enough chocolate on hand, pure laziness… There are many things that can get in the way. Sometimes it takes getting up early or staying up late in order to get my writing done. Other times it takes a kick in the backside. 6. Where’s the strangest place you’ve ever had a great writing idea? At Busch Garden’s in Houston (it no longer exists). I was about fourteen years old, visiting the park with my aunt and sisters, and we were riding some kind of roller coaster (not a fast one—I still can’t handle those). I was looking at all the girders and twists and turns, and got a great idea (at least I thought so) for a chase scene between a couple of spies in an amusement park. That must have been during my Ian Fleming phase. Believe it or not, Mom actually let me read James Bond stories when I was a teenager! I still think about that scene whenever I visit an amusement park, but I haven’t written it into a book…yet! The Carolyn Keene Nancy Drew series was my hands-down favorite. In fact, the first book I remember reading that wasn’t a children’s book was The Ghost of Blackwood Hall. I was hooked on spooky stories forever after. I also loved the horse stories by Marguerite Henry, with King of the Wind being my very favorite. Then I graduated to Victoria Holt, Helen MacInnes, Ian Fleming and Alistair MacLean. 8. I’m always intrigued by how writers get started…did you always have these books inside you and knew that you wanted to write them or did the idea just pop into your head one day and you decided to put pen to paper? I’ve been a storyteller as far back as I can remember. I used to make up stories for my three sisters —whether or not they wanted to listen! I started writing stories in about the third grade but didn’t start trying to publish any of them until much, much later. Story ideas are constantly popping into my head, but most of them don’t have enough meat on their bones to grow into anything. But that’s okay because just enough of them flesh out to keep me pretty busy at my computer. 9. What do you do when you hit a roadblock and have NO idea what to write? That doesn’t happen very often, but when it does, I just look around. There are story ideas everywhere—look at the news, listen to neighborhood gossip, eavesdrop at the grocery store—there are plenty of cell phone conversations you can’t help but overhear. A single word or image can spark a story. You just have to start with one sentence and run with it. 10. I assume when you start a book, you pretty much have the plot laid out. Do you ever change your mind later on in the book, and go in a different direction? I’m a hybrid plotter/pantster. I usually begin a story with a single character – either the hero or the heroine—in a particular situation. I’ll sketch out that scene then create the other major characters and plot the basic storyline. Then I start writing, revising the plot as the characters and action direct me. But the book can definitely go in a different direction if one or more characters get ornery. 11. What is one thing that you “never saw yourself doing” and either do it now or have done? Snore! A couple of years ago my husband told me I do it pretty loudly. I was so appalled at the idea, but now I even wake myself up sometimes. 12. Do you remember where you were or what you were doing when you started this story? For Moonrise, the scene in the Disney version of Beauty and the Beast where they are waltzing in that amazing ballroom sparked the entire story. I remember riding home from the theater after seeing it, and having this story unfold in my mind. It was like a gift from God. I wrote the book quickly then life got in the way and I had to focus on my ‘real’ job. 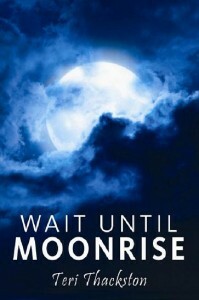 Moonrise is the book of my heart, and I’m so proud to have finally published it. all are in ebook format while a few are available in print, as well. This entry was posted in Hallee's Interviews with Christian Authors and tagged author interview, interview, moonrise, readers write to know wednesdays, teri thackston, wait until moonrise. Bookmark the permalink. Hi Teri and Hallee! Teri has wonderful stories, but her ghost (or in this case, cursed) stories are the best. Thanks, Hallee, for the interview. It was fun! Thanks, Suzan. Same goes for your zombie stories. They make me shiver…with delight! I think it was wonderful that your Dad brought you home a typewriter! You book sounds wonderful! Great post. I loveTeri Thackston’s books! Thanks for the insight about how she comes up with her fabulous ideas. Thanks, ladies. Yes, my dad is the best! He and Mom have always been so supportive of my writing efforts. I love ’em!